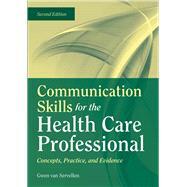 Communication Skills for the Health Care Professional is the first text of its kind to address the connection between communication practices and quality patient care outcomes. It provides future and practicing patient caregivers in all specialties and services with basic communication knowledge and skills and is an invaluable resource for those in administrative functions as well. The Second Edition is a thorough revision that features five all new chapters covering: communicating with patients with low literacy; health communications and quality care; health communications to enhance behavioral change; the internet and communications between patient and provider; altering systems of care and implications for health care communications. Features: Provides a psychosocial and physiologic contextual background for understanding sensual development and verbal and nonverbal expression. Teaches communication skills one at a time allowing for contiguous mastery over a set of therapeutic interventions. Includes an extensive glossary of terms and list of references including websites and resources available to enhance student learning. Is accompanied by online instructor resources including an instructorrs"s manual and PowerPoint lecture slides. New to the Second Edition: bull; New chapter on Communicating with Patients with Low Literacy bull; Four new chapters on expectations for health care communications, evidence for quality and behavioral change bull; All chapters have been revised and updated bull; Updated resources bull; New tables bull; Up-to-date evidence Click here to access our transition guide-and make changing your course materials from the first edition to the second edition as easy as possible!